Test Tubes in a black wood holder- not 100% sure whats going in them yet. I found the wooden holder at Goodwill, and with a coat of black spraypaint it's perfect for Halloween. The little pewter dish in the back is full of spiders and I also found it at Goodwill. Creepy black flower arrangement. Let the record show that I usually do NOT allow fake flowers in the house- this is the ONE exception. I got one of those heinous fake flower arrangement things, you know the kind that have lots of flowers on them and are attached by a green plastic handle. I used wire cutters to separate the flowers and stuck them in a block of Styrofoam (I found it in our building trash room, if you don't have that an empty cereal box should work to keep them upright ). Once they were all stuck in the Styrofoam I took them outside and gave them a few coats of black spray paint. 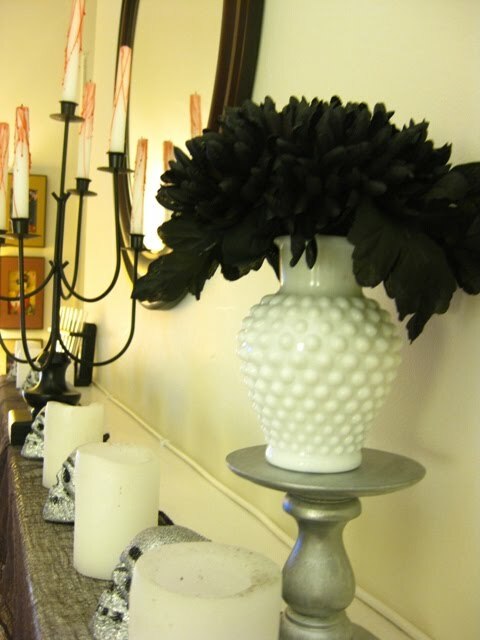 Once they were all dry- I had three scary black flower arrangements to put around the house. What creepy things are you planning for Halloween this year? Do share, I could always use more ideas! Wow - you put me to shame in the Halloween decor department - and I have a kiddo! They don't celebrate Halloween down here, so it sort of takes the fun out of decorating, but I DO need to get with the program for Avery's sake! Alison- you have a much more important job in taking care of Avery, I can imagine that takes up alot of your free time:) My boyfriend thinks I have seriously lost it because I've spend hours and hours shopping, planning and making things haha. Lindsay, I am soooo with you on the spooky halloween fun! I love halloween! One year, we put away all of our rugs and brought a bunch of leaves into the house (um, after having cleaned up leaves for months, I don't recommend this! ), but it was lots of fun! You did an awesome job! I think the creepy candles are my fave! Great job! It's coming along so nicely! Can't wait to see the final details. Lindsay you are the BEST!!!! ! your place is looking amazing!!! I wish we lived close rso you could take me on your DIY adventures with you!!! We're having a kiddie halloween party and I have a ton of brass candlesticks (painted pale blue at the moment from a baby shower) that are going back & all around the house just like yours. We splurged in a HUGE black skull container from Target that I'm going to get put a drink in... But other than that my list is LONG and I have yet to get started!! Your ideas are AWESOME and I just loev your fake flowers!!! I am so doing that if there's time!!! YOU"RE A HALLOWEEN GODDESSS!!! MY HERO!!!! ok, off to look up how to make your skull candle..
Lauren you are too nice! I'm jealous of your skull container, I saw that at Target and wanted it really bad but there were so many other things on my list to get that the budget didnt go for it this year :( I'm hoping I can find something cool at the Goodwill to use for drinks. The target leggings are pretty good- these are the Merona brand. A bit see through but not bad. Way to go! 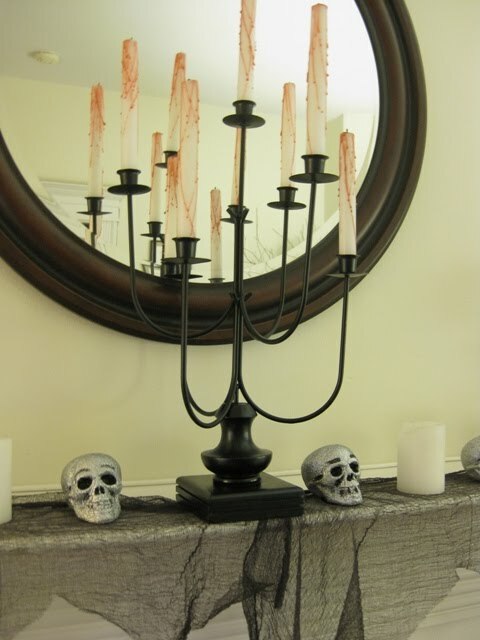 I can tell you've put a lot of thought into it and I love the spooky candles!! My first time to your blog - and I love it! Love your halloween decor, and the prior post. Your writing is witty and makes me want to keep on ... great blog!! Hope you can stop by and see my Dining Room turned Library. I was gonna just try it for the picture - but I think I might have a library for good now! LOL! Take care! Wow, you went all out. What fun. Black flowers are great. 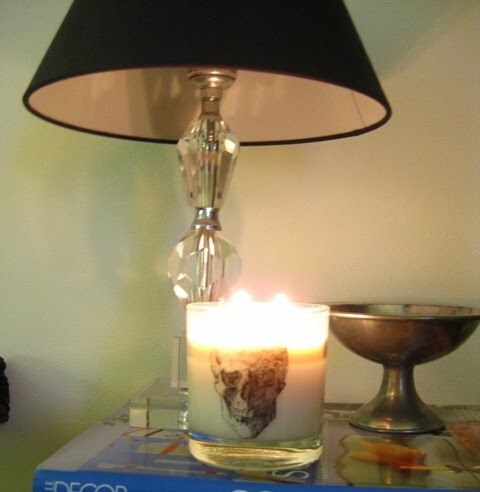 Great goodwill find-- I LOVE that candle holder! 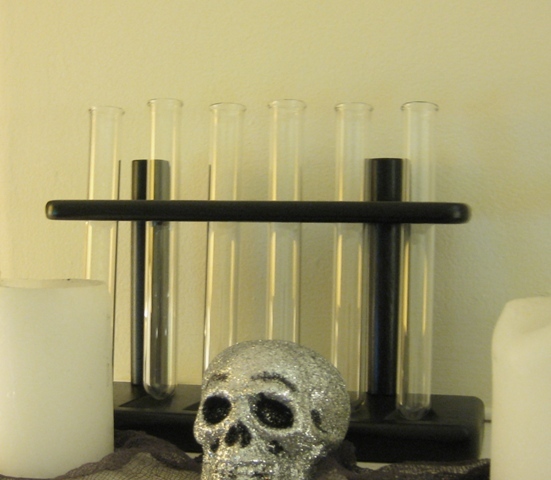 The skull candle looks great too-- very spooky! I LOVE the skull candle idea! I wish I had the time to even do ONE Halloween decoration! It looks sooo good! Dear Friend, when will you start your decorating business? You have such a good eye and I always love your posts of your own house. They look like magazine shoots!